On Monday 23 March, Cardinal Vincent celebrated a Requiem Mass for the repose of the soul of King Richard III at Holy Cross Church, the current Catholic parish church and Dominican priory in Leicester. Coming three days ahead of the King's re-interment at Leicester Cathedral, the Mass was concelebrated by Bishops from across England and Wales. 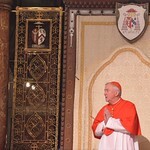 Cardinal Vincent wore a chasuble that dates back to the time of Richard III. Known as the 'Westminster vestment', it was made in the latter half of the 15th century and could have been worn by priests at Masses attended by the King. The chasuble today forms part of the heritage collection of Ushaw College, the former seminary near Durham. 'This evening we fulfil a a profound and essential Christian duty: that of praying for the dead, for the repose of their eternal soul,' said the Cardinal in his homily. Acknowledging that 'Richard was not a man of peace', the Cardinal noted that he lived during a turbulent time. Despite this, he was 'a man who sought to offer to his citizens justice through the rule of law'. Noting that the king's 'actions did not always match those words,' the Cardinal prayed that 'the merciful judgement of our loving God is extended to him in every degree, for we know that it is only the gift of God's mercy that protects us from the demands of God’s justice'. The music for the Mass was selected from a range of composers from across the British Isles and from the plainsong tradition, which characterises the daily life and prayer of the Dominican friars of Holy Cross Priory. Some of the pieces were performed by the Choir of Saint Barnabas’ Cathedral, the Cathedral of the Diocese of Nottingham, the choir of Holy Cross Priory and the choir of English Martyrs’ Catholic School, Leicester.